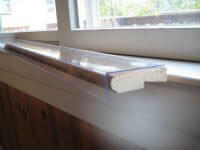 This is my clear Sill Shield 29-1/2" long. It is available in 3 standard depths, 2-1/4", 3-1/4" & 5-1/4". As with all my shields, they attach in seconds with NO TOOLS REQUIRED.